Please don't take out my gif. Just link back to this page for viewing. 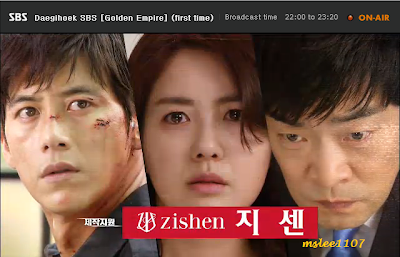 I just finished watching the first episode of the drama Empire of Gold which aired this week, Monday 9:55 KST. 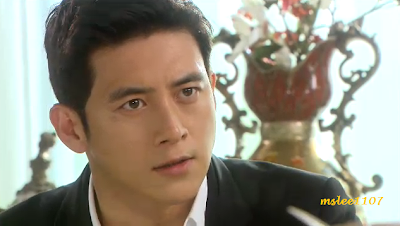 The drama started with the handsome Go Soo in his character as Jang Tae Joo. Although the scene is yet to be understood, the timeline I think is current. He exudes as a ruthless businessman. A man who will do anything in his power not be seized or be a pawn in the game of politics and business. With his handsome face and looking very, very suave in his suit, he began to bargain with a congressman. He can not be fooled easily. He knows when he is being deceived. He is as cunning as the next villain in a drama. In an attempt to coerced, convince and threaten the congressman to take a vacation outside the country and not turn him in [for reasons I have yet to uncover] he did not continue to stab the man. But when he turned away, he sensed and that's when he killed him. Witnessing all these was Yoo Seol Hee, a beautiful woman who I later knew as a friend of him, who I think is in love with him. She uses her body, like what the opening story told, to benefit maybe herself and for the love of Tae Joo. The scene was very tense, powerful and as a pilot episode, I'd say, it captured my interest. Tae Joo used his charm, her love for him, as he kisses her through her shock of what transpired before her eyes, to confessing the crime herself via a phone call to the authorities. Once again, you can see how fearless Tae Joo can be if he wanted to. The ironic part, after the crime, he is found inside a church getting married to the heroin of the drama played by Lee Yo Won as Choi Seo Yoon. They both look good together. I felt the chemistry, albeit a very cold atmosphere inside the church. It was a wedding but just the two of them and a priest with a couple of boy ushers at the side. What a wedding for our heroine and hero or should I call him villain? Lee Yo Won as Choi Seo Yoon is the daughter of one of the richest man in the construction business, Choi Dong Sung who has a brother Choi Dong Jin. The story will revolve around the empire/company and from what I watched so far, Seo Yoon really is doing her best for the love of the company and her father. I found Seo Yoon's character as that of a timid, obeying daughter, but there is also a glimpse of hidden intelligence and fire within. She looks like a person who can't be put down easily, but willing to do anything for her family. She protects her mother from troubles, yet, she might be in for a surprise, for being deceived in the process. I am still not sure, though. But her number one rival inside the company is the President, Choi Min Jae, [Son Hyun Joo] who happens to be her cousin. A very ambitious man that show his capacity to be ruthless and cunning to the point of maneuvering decisions already made by Seo Yoon's father who is unfortunately in a hospital. A very serious decision that will put Jang Tae Joo's family in sufferance and that will somehow make Tae Joo be a part of this crazy grab for power. At stake was his father's life who was only dreaming of something for the family but because they are poor, while rich men hold all the buttons, he had an accident during the violent face off, the tenants of the building who already put a lot of money and the gang hired by MinJae. For a viewer like me who is always waiting for subtitles, it is a very complex drama to watch, but I know after a couple more of episodes, I will be more comfortable on how the story is moving. There are so many characters to look out for. A complicated plot of money and power hungry people that will show how they turned to be one. For now, this is my first look and first impression of the drama. My first review. for screencaps I already posted on previous blog. [mslee's thoughts] Mad Dog - A Scam That Becomes a Conspiracy? mslee1107 tries updating this page with thoughts and some news regularly. please bear with this admin. if there's time. I try to go over my post and add corrections. Kwon Sang Woo in MBC New Drama "Medical Top Team"
Teaser - CNBLUE's 6th Japanese Single "Lady"
Ha Ji Won and Lee Jin Wook in The Time That I Loved You, 7000 Days via SBS Soon!